Make a big jar and pumpkin spice yourself crazy :-) Essential for making pumpkin pie and a tasty way to flavor coffee and sweet potatoes. Mix together and store in a jar. It is excellent in coffee, on a thick glass of eggnog, on sweet potatoes and in pumpkin pies. For coffee: For every 12 cup pot, put approximately 3/4 teaspoon in with the coffee before brewing. Sweeten with honey. Adjust as you see fit. 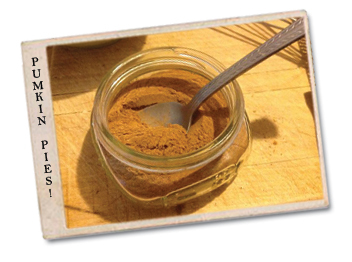 For Sweet Potatos: Mix 1 Tablespoon pumpkin pie spice with 3 tablespoons brown sugar. Peel and cut 2 large sweet potatoes into 1" slices. Melt 3 Tablespoons butter. Toss sweet poato slices in pumkin pie spice and butter. Place in an even layer on a cookie sheet and bake at 375 for 20 minutes and turn. Bake for another 20 minutes or until soft. Note: Sprinkle it in your Halloween pumpkins before lighting the candles for the best smelling jack-o'-lanterns in the neighborhood. Revised: 8-10-14 as original recipe did not make enough.